Need help with 20" doll! 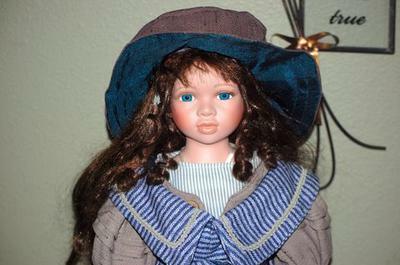 This doll was in a garage sale many years ago and given to my Granddaughter. She is 20" tall. Has a porcelain head and shoulder. Porcelain forearms and cloth body. She has a closed mouth and porcelain legs from the knees down. The back of her head is marked 199035B2 with SP below it. I can't tell for sure if it is a 'B' in the number or an 8. If anyone can identify where this doll was made or the age of it, it would be appreciated.